Isis-Sothis, seen on the maze mosaic as Ariadne, her Minoan equivalent, was often portrayed by the Egyptians as traveling with two Sirius companions, Anukis and Satis, in the same celestial boat, namely the Argo. (3) On the maze the goddess is in the company of these two female companions, plus two more, Theseus (Osiris-Sirius) and the white dwarf Diktys, or Sirius B, the white dwarf star of the Sirius system. Even the Minotaur symbolizes Sirius, for in the Egyptian sense he is Apis, the bull containing the spirit of Osiris, shown holding the crook and scourge of Osiris. Correspondingly, Daedalus, the great architect of Crete who designed the maze, is the Minoan equivalent of Imhotep, the brilliant Egyptian mathematician, engineer and architect who designed and built the first pyramid. Imhotep, idolized by the Egyptians during his lifetime, was raised to the status of a god after his death. The square Maze of Daedalus of Crete is the truncated and flattened pyramid of Imhotep, and both are physical structures expressing the vertex-vortex. Through cultural diffusion whereby Phoenicia gained religious knowledge from the Books of Thoth, (4) Imhotep-Daedalus became the great mythical Ugarit architect Kothar-and Hasis (Hathor-and-Isis? 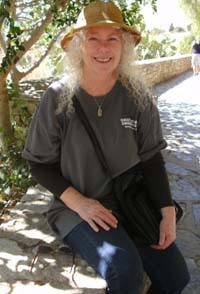 ), who came from Crete to design Baal's palace. Hathor (far left) is the Sirius goddess who is daughter-in-law of Isis (center left, veiled and unveiled) and wife of Horus, (left) brother of Seth. Even Typhon symbolizes Sirius, for he is the Egyptian Seth (Sothis). The lineage of these gods must be kept secret. In Greek legend, pre-dating the events portrayed on the maze mosaic, the Argo was a gift from Hermes (Thoth). The ancient legend of Jason and the Argonauts came after the material under investigation here! 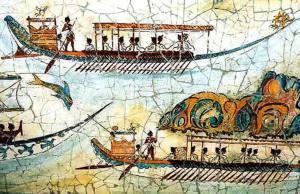 The Argo, a celestial boat, was crewed by 50 oarsmen, all related to each other, called Minyae, the descendants of King Minyas, from which Minos and Minoan may be derived. (5) The artist of the Phaistos Disk may have been one of the Minyae living in Crete who went unnoticed by the Cretans, the "Idaean Kuretes, race divine," (6) because they looked like them. (left) They were their archetypes, "the word in Greek being related to "ark" of Noah's ark. "(7) The Minyae were the "arktypes" of the Minoans. 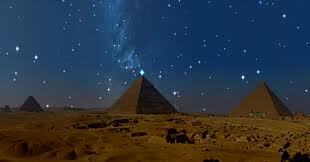 They were from "the Other World," arq-hehtt in Sanskrit, which the ancient Egyptians located at the star Sirius. (8) Some of the earlier Minyae arktypes arrived in the celestial boat memorialized in stone as the Hagia Triada palace. The Arko, rather the Argo, was crewed by people who spoke Gothic, the langue argotique or language of the Argo, according to the mysterious alchemist Fulcanelli. (9) But though the Argo was equipped with 50 Gothic speaking Minyae as oarsmen, it had no need of them as oarsmen. The Argo was famous for its built-in system of self-propulsion. ­(10) The Argo was computerized. "The Argo itself could speak and guide or warn the Argonauts at critical moments." (11) According to legend, the Argo was made of psychic oak or cedar timber belonging to the oracle of Zeus at the Greek omphalos, which was fiercely guarded by Humbaba with a round maze face. (right) The Argo crew could be teleported from the ship to the ground. When Captain Jason "threw his teeth on the ground," they sprang up as fully armed soldiers. (12)The legend of Jason and the Argonauts becomes newly interesting when followed along in this new light. Apparently, a reconnaissance mission was required when one of the Argos, specifically the Golden Ram, was stolen away to a remote Egyptian colony on the Black Sea, and Captain Jason was commissioned to retrieve it. He was assisted by some of the crew of the Golden Ram who must have mutinied and been ejected into the Hellespont, named for Helle who fell from the Golden Ram, where they were found swimming in the Black Sea and were rescued. (left, cylinder seal found at Knossos, pictorial history of the theft of the Golden Ram? 1600 BCE). There is also the legend of Daedalus and his son Icarus, who were involved in an incident in which one of the Argos crashed. Daedalus and Icarus escaped from the maze-pyramid by putting on wings and flying away. When Icarus flew to close to the sun, his wings fell off and he crashed. Legend records information regarding the individual Minyae, wherein some of them went AWOL, one went crazy and other settled down with Earth women. All these had to be replaced with new oarsmen, the only requirement being that the new recruits be Minyae and of the same "family" as the crew they replaced. The rest of the Minyae returned home on the Argo and the Golden Ram, which then flew away into the sky to become stars. Races as advanced as the diverse and "divine" Sirians and Jason and the Argonauts, who know how to find the portals in the curtain of space-time and energy-matter, also know how to create them with advanced portal technology. In order to create a portal in the curtain to teleport objects through the electromagnetic field, the Sirians first duplicated faithfully the geometry of the curtain, so that electromagnetism could be controlled and the curtain lifted. The geometry of the curtain is duplicated in the architecture of Cheops, which the ancients believed contained the secret order of the cosmos. The design of the pyramid accomplishes the squaring of the circle, the cubing of the sphere and the production of the portal. As the maze mosaic demonstrates, the base of the pyramid is a square (below left) with a perimeter equal to the circumference of a circle (below right) whose radius is the height of the pyramid. The circle superimposed onto the square (above right) produces a diagram in which the pyramid is seen to represent the circumference of a circle whose radius is V1, which is the Central Pillar of the curtain and the straight-down-the-middle path into the maze puzzle and into the palace at Knossos. When the triangle represented by P1, P5 and P6 is drawn, a mathematically correct cross section of two sides of Cheops is produced, (below left) comparable to the Phaistos Disk pyramid. (below right) Now the Argo is seen navigating the electromagnetic curtain at the vertex of Cheops and coming through the portal created in the cubic curtain of space-time and energy-matter. The vertical lemniscates (figure 8) of the maze mosaic and the Phaistos Disk symbolize this different perspective of an upright nature. When the circle is enclosed by the second square on the maze mosaic, a method is produced for turning spherical surfaces into plane surfaces equal in area. To produce a rectangle of equal area to the circle, the two sides of the interior square are extended until they meet the sides of the outer square. The area of the circle is the same as the area of the rectangle. Half the circle equals half the rectangle. Half the circle is equal in area to the spherical surface of a quadrant of 700, as is the rectangle. Three such rectangles, each containing two cubes, comprise the representative section of the curtain shown in this book. 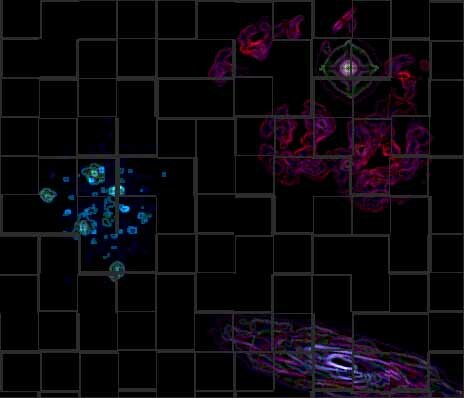 A space-time composed of cubic geometry, measurable by Kanaga (Cubic Space-Time Ruler), is shown on both the curtain and the maze mosaic. A natural vortex exists at the vertex of the pyramid as a "fourfold external spiraling flow-pattern." (13) Manipulation of this vortex by sound wave technology opens the portal and effects the Daath Bridge, connecting Earth with other parts of the universe. This natural accumulation of electromagnetism was enhanced by electrical equipment, once part of the interior of the pyramid. The truncated pyramid, 142 ft. high and 175 ft. square, was built as a platform "exactly half the area of the base of the Pyramid," (14) as the first construction stage in the production of the portal. Cheops was truncated at the 50th layer of masonry, with Grand Gallery access to the platform. Egyptologists Richard Anthony Proctor and Eugene Michel Antoniadi believed the truncated pyramid was used as an astronomical observatory. It may have been built, however, for other purposes. At the center of the platform was the so-called King's Chamber, part of the equipment used to create the portal. The King's Chamber, (top right) now inside the pyramid but built separately from the surrounding pyramid, was once the central object on the platform, functioning as part of the electromagnetic energy generator/accumulator. Composed of polished red granite blocks, distinct from the limestone blocks of which the pyramid is built, the chamber is 34 ft. long, 17 ft. wide, and 19 ft. high to the first ceiling. Inside the King's Chamber is a coffer weighing three tons and made from a solid block of chocolate-colored granite. (right) Both the granite of the coffer and of the Chamber contain quartz, a piezoelectric material important to sinusoidal oscillators and pulse shaping. The cubic capacity of the coffer in the King's Chamber, according to Egyptologist Worth Smith, is exactly the same as that of the Ark of the Covenant. The Ark was described by Maurice Denis-Papin as the electrical Arc of the Covenant, an electric capacitor that produced charges of 500 to 700 volts. (15) Electrical equipment such as this probably was once contained at the center of the pyramid by the coffer in the King's Chamber. Pyramid means "fire in the middle." This Dwat-designed King's Chamber held other equipment for opening and maintaining the portal. The equipment housed by the King's Chamber may have been a huge electrolytic capacitor, which has a much higher capacitance for storing electric charge than any other type. A tantalum capacitor would be appropriate for these purposes, as it is said to be ideal for military and communication applications because it is very stable and does not deteriorate after long periods of rest. To construct a tantalum capacitor, tantalum and manganese are required, and iron is fundamental to electromagnetism because it is highly conductive of magnetic lines of force. The topsoil of the Nazca Plain is a thin coat of manganese, iron and iron oxides. To take enough of this material from the top soil, aerial miners would need to make innumerable straight-line passes over the plain, carefully gleaning the manganese and iron from the top soil and creating the "mysterious" dump piles at the end of the lines. Iron tantalate, the chief ore of tantalum that is rarely found without manganese or columbium, may be found in the underlying soil of volcanic pebbles of the plain or it may have been taken from the Andes. Columbium (niobium) has been used in thermal nuclear reactors, which may explain the residual radioactivity at Cheops. Both the King's and the Queen's Chambers are vented to maintain a constant cool temperature of 68 degrees, and both have the same arched roof design matching exactly the symbols for Cheops on the Phaistos Disk that were connected to produce the pyramid image. The Queen's Chamber is situated on the vertical axis, the omphalos, of the pyramid, corresponding to the central pillar of the curtain of space-time and energy-matter. Inside the chamber is a large, recessed niche, now empty, which once contained a piece of the vertical equipment of the portal mechanism. The chamber is 18 ft. 10 in. x 17 ft. 2 in., and the niche is a little more than 16 ft. high and 3 ft. 5 in. deep. When the Queen's Chamber was excavated the walls were found encrusted mysteriously with salt a half-inch thick, evidence of the brine electrolyte used in the generation and accumulation of electromagnetic energy. 600 ft. directly below the vertex of the pyramid is the Subterranean Chamber, 31x27 ft., the geophysical equivalent of an electrical plug in an electrical outlet. The natural electromagnetic energy of the earth may have been methodically tapped, the current flowing through the conductor for which the "well" and the grotto were dug, completing a circuit between the Subterranean Chamber to the rest of the power equipment and culminating at the vertex of the pyramid. After the well and grotto were complete, the passage to the Subterranean Chamber was plugged with granite blocks. The entire system was designed for creating and maintaining the portal so that matter could be transported across trillions of illusory miles. A different perspective of a vertical nature is the view of the portal equipment, (left) illustrating the "well shaft" construction that was designed to produce and pump, not water, but electromagnetic power strong enough to change the polarity of the curtain of space-time and energy-matter, strong enough to displace the electrostatic field and create a portal and a negative space--a Daath Bridge--to negate the distance from Sirius to Earth. The portal was created by practical application of the inscription from the Riddle of the Stone, called the Vitriol Acrostic, which reads, "Visita Interiora Terra Rectificando Invenies Occultum Lapidem." Visit the inward parts of earth; by rectifying thou shalt find the hidden stone. Rectify, meaning to put right or to adjust, also means to change an alternating current into a direct current, and a rectifier is a device for changing alternating current into direct current. The Subterranean Chamber--the inward parts of earth--may have housed part of the equipment necessary to alternating current voltage. On the maze mosaic are 16 arrows pointing one direction and 16 pointing the opposite direction, symbolizing alternating or AC voltage. (far left) The lemniscates of the mosaic, each with a cross in the center, (far left) symbolize current flowing in the same direction, or DC voltages. This symbol is in use today to indicate DC voltage. (left) When AC voltage is generated, the varying values of voltage, the electromotive force, are representing by a sine wave, the waveform closely associated with the properties of a circle and right angled triangles situated within a circle from which the sine and cosine of an angle can be determined. The frequency of the voltage--the number of sine waves that are generated each second--alters the electromagnetic field and opens the portal. On the sine wave (above) EM (rotating vector ) anchored in the Minotaur's square on the maze mosaic, is 00 at #12, where Ariadne waits, and #6, where Theseus and Ariadne turn the wheel or alternator. At this vector, zero voltage is produced. In the semicircle above 00, the sine wave values are positive. Below 00 they are negative. When EM is 300 at #1, the square with the vertical lemniscates, and at #5, the square with horizontal lemniscates, 50 volts are produced, represented by V1 and V5 on the sine wave. When EM is 600 at #2, halfway between the lemniscates and the Argo, and #4, halfway between the Argo and the lemniscates, 86.6 volts are produced, represented by V2 and V4 on the sine wave. When EM is 700 at #3, the square with the Argo and the Sirians, the portal opens as maximum voltage is achieved, represented by V3 on the sine wave which corresponds to the vertical axis of the pyramid and the central pillar of the curtain of space-time and energy-matter. Sine wave generation is enhanced by the piezoelectric properties of the quartz granite inside Cheops. Where sinusoidal oscillators are used, piezoelectric material produces oscillations, and the AC charge has an application in pulse shaping. Sound wave technology assists in opening a portal in the curtain. The ancient Egyptian name for the pyramid was M(e)r, meaning place of ascending. This ascending, made possible by the Daath Bridge and the portal, enabled the Sirians to traverse light years of space in an instant. Electromagnetic navigation- Electromagnetica Nautica- exposes the illusion of extended articulated space, an illusion created by the curtain of space-time and energy-matter. Cheops is compared with Kephren's copycat pyramid that lacks the portal equipment. The builders of Kephren's pyramid knew so little about the mechanics of the portal that they failed even to dig the subterranean chamber deep into the natural rock, where the earth energy of the convergence point can be tapped. This AC-DC voltage information from a 16th century Benedictine monk named Basil Valentine (artist, Vitriol Acrostic) is no more surprising than a 12th century tile mosaic display of the Sirians coming through the portal at Cheops. Many people who propose the Sirian theories also claim the Sirians are Aliens Among Us and Strangers Among Us, two books by author Ruth Montgomery, who asserts that the Sirians still look like us. In fact, some of them are us, and a glance back at the portrait of the Anonymous 16th Century Gentleman in Forms and Archetypes of the World Soul, as he signals "open channel," and also a quick study of the pyramid behind him topped by that Starship, are enough to cast suspicion on him. Also deserving of a second look and a different perspective of a vertical nature in the same book is the Sarcophagus of Lord Pacal, which Erich von Daniken still insists portrays an ancient astronaut in a rocket ship. These people, and many of the artists of the works featured in Forms and Archetypes of the World Soul, were much more than they appeared to be, and whatever they chose to convey through their art, they concealed as much as they revealed. They considered themselves to be those of the Shield--hand shield, the final shield and figure 8 shield--those of the cosmos shield guides. All of them, Basil Valentine, the Anonymous 16th Century Gentleman, Lord Pacal, the artist(s) of the Maze of Daedalus mosaic, the creator(s) of the Phaistos Disk, and many of the others acquired hidden intelligence through inner access of the Universal Mind and the collective unconscious, wherein is held all the knowledge of the past, the present and the future--what was (fire), what is (earth), what shall be (air)--three parts of the philosophy of the whole world. Thanks be to thee, Hermes Trismegistus. Asclepius, the Nag Hammadi Papyri; 2. Godfrey Higgins in Mead; 3. Temple; 4. Philo Byblius, Phoenician Histories, in Mead; 5. Temple; 6. Hippolytus, Philosophumena, in Mead; 7. Temple; 8. Ibid. ; 9. See Ch. 4 in Forms and Archetypes of the World Soul re: Chartres Cathedral; 10. Temple; 11. Ibid. ; 12. Ibid. ; 13. R. and V. Baer; 14. Peter Tompkins, Secrets of the Great Pyramid; 15. Ibid.